More than 230 million invasive surgeries are performed worldwide each year — and nearly all of those procedures create additional tissue damage from stitches and staples. Researchers at Purdue University are hoping to significantly decrease that damage with a new surgical adhesive technology. The Purdue team is working to solve one of the major challenges in the biomedical technology field – most adhesives do not work well in moist environments because water interferes with the adhesion process. That means they cannot work inside the human body. Glue developed by the Purdue team uses a family of proteins and a modified amino acid to form a strong elastic bond between the soft tissues being joined. The Purdue researchers were inspired by natural glues that are created using the proteins produced by underwater organisms such as mussels and sandcastle worms. 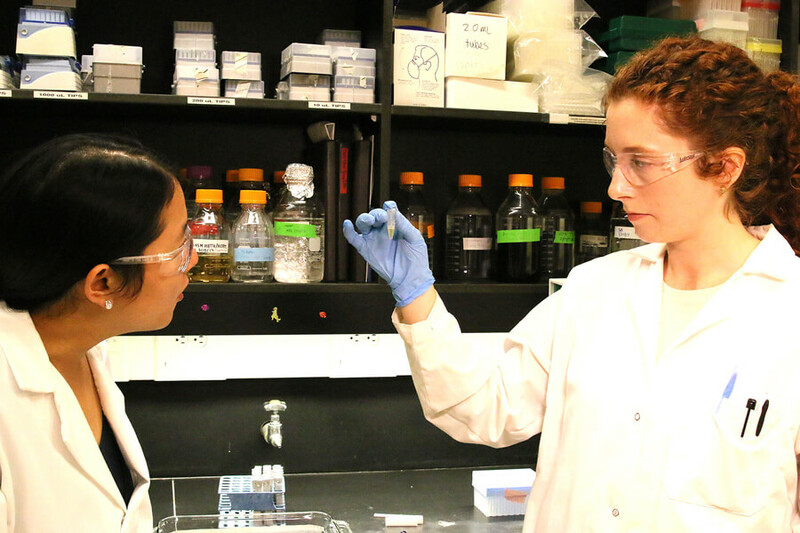 Purdue University associate professor Julie Liu, at left, and doctoral student Sydney Hollingshead helped create a glue that could make medical procedures safer. The Purdue glue has several advantages over sutures and staples, including reduced patient discomfort, lower risk of infection and less damage to surrounding healthy tissue. The technology aligns with Purdue's "giant leaps" celebration of the university’s global advancements made in health, space, artificial intelligence and sustainability as part of Purdue’s 150th anniversary. Those are the four themes of the yearlong celebration’s Ideas Festival, designed to showcase Purdue as an intellectual center solving real-world issues. Liu also said that commercial glues sold as liquid bandages for cuts and scrapes do not work for surgeries because the chemical makeup of those glues is toxic when used inside the body.